More construction photos at the end of this report. 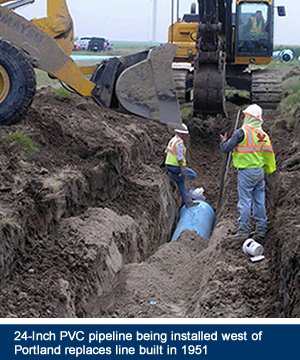 The Water District has been busy the past two years building new infrastructure to increase capacity and to improve water delivery system flexibility for municipal and industrial customers. A total of $20 million in pipeline, storage, pumping and filtration projects have been completed or are under construction. District General Manager Brian Williams, P.E., notes that three quarters of the improvement costs are being paid for directly by industrial customers that have long-term water supply contracts with the District. The largest project is a new 24-inch transmission line that is replacing most of a line originally built by Reynolds Metals in 1951. Portions of the line had been replaced in the past but it has been out of service for several years because of the poor condition of the remaining section. Once replaced the line will change how the District provides drinking water to Odem, Taft, Portland, Seaboard Water Supply Corp. and Rincon Water Supply Corp. The 17-mile long pipeline is being built in three phases with an estimated total construction cost of $11.6 million. Contracts to build Phases 1 and 2 covering a total of 12 miles were awarded in 2015 to S.J. Louis Construction and the work is nearing completion. Phase 3 will go to bid in 2017. The 24-inch line will deliver up to 5 million gallons a day (MGD) of treated drinking water to the District’s western customers and will “free up” water supplies that can be used to meet growth in customer demand east of Portland. Ingleside Ethylene LLC is providing funding for replacement of the 24-inch line and has contracted to take 3.5 MGD in filtered industrial water from supplies made available by the system balancing project. 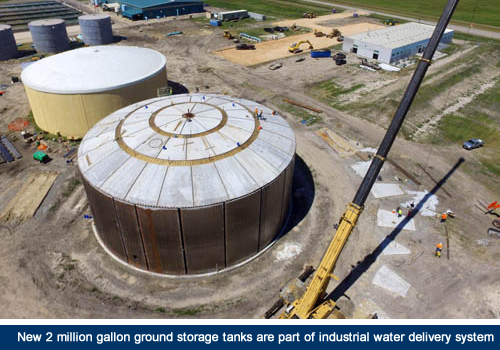 A pair of 2 million gallon capacity ground storage tanks at the District’s filtration plant complex are now complete. They will be used to store filtered water being delivered to industrial customers. The first was built with half of the storage dedicated to Ingleside Ethylene and the other half upsized by the District as unreserved space to serve existing system demand. The north tank was built by DN Tanks under a $1,142,100 contract. The second 2 million gallon tank was built to serve the needs of Cheniere Energy’s Corpus Christi Liquefaction which is building a liquefied natural gas export facility on the north shore of Corpus Christi Bay. The south tank was built by DN Tanks under a $1,021,000 contract. Two pipelines (16” and 6” PVC) are currently under construction to deliver industrial grade water and drinking water from the District complex to the Cheniere plant site. The four miles of pipelines are being installed by Bridges Specialties, Inc. and Jhabores Construction Co. in two phases with a total contract amount of $2.8 million. A new industrial water pump station was completed in November that will serve Ingleside Ethylene and Cheniere. The $1.1 million project was built by Associated Construction Partners, Ltd., with electrical and HVAC improvements done under contract by Coonrod Electric Co. The building includes extra square footage to accommodate installation of additional pumping capacity in the future. Also completed in November is a new $3.2 million operations and administration building which allows laboratory, instrumentation, technical services, maintenance, engineering and administrative personnel to be housed in a single location. The facility was designed by Richter Architects and built by Beecroft Construction under a best value contract. Planning for new offices that would get some personnel out of temporary quarters began almost a decade ago but design and construction was put off while other priorities were addressed. 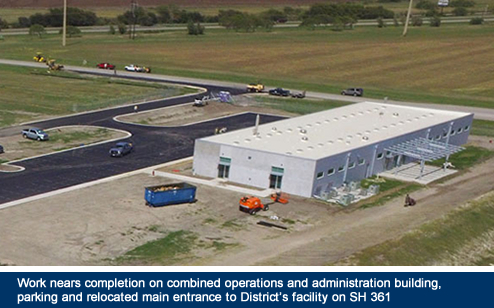 Access to the building and the entire District complex has been moved from State Highway 361 to a new main gate located on the OxyChem/Chemours entrance road, about 700 feet south of SH 361. 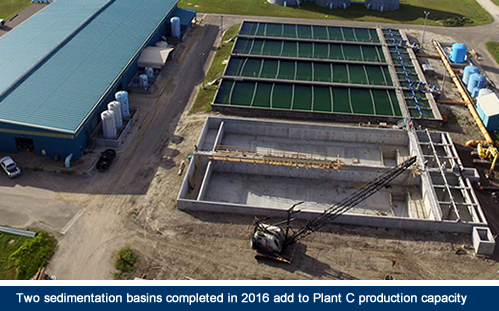 Work was completed in July 2016 on expanded production capacity for the District’s Plant C, an advanced membrane microfiltration facility that produces drinking water and made-to-order industrial water streams. CSA Construction, Inc. built the $3.68 million project which included adding two sedimentation basins to the four that currently feed Plant C. One of the basins is needed to serve TPCO’s pipe manufacturing plant and the second expands the system serving all District customers. An additional membrane rack was installed in Plant C to help deliver the 2 million gallons a day contracted by TPCO. Plant C currently now has a capacity of 19.4 million gallons per day. It was designed so that it can be incrementally expanded up to a maximum of more than 40 million gallons per day by adding filtration modules and other equipment. A companion project paid for by TPCO was an 8,900-foot 36-inch interconnect pipeline parallel to La Quinta Road completed in 2015 by Jhabores Construction under a $2.5 million contract. The connecting line increased the delivery efficiency of the District’s raw water supply lines coming from the Nueces River and the Mary Rhodes Pipeline system. TPCO paid $5.58 million of the total cost of the two projects and the Water District provided $586,000 to pay a portion of the cost of the sedimentation basins. Work was completed in 2015 on installation of 1.5 miles of 12-inch PVC water line which connects the voestalpine Texas iron reduction plant to the Water District's 42-inch Gene Dressen raw water supply line near the north boundary of the Port of Corpus Christi Authority's La Quinta property. voestalpine provided the $442,871 required to plan and build the pipeline. The line was installed by Jhabores Construction under a contract awarded by the Water District. The District also installed a 1.8 megawatt diesel powered backup power generator capable of supporting all the power load at the District’s complex in case of power outages. The District has redundant backup generators and direct-drive pumps that allow treatment and pumping operations to continue during an interruption in service from the electric grid. New containerized electric power generator is part of backup systems. Work on industrial water pump station near completion. New rack of Pall microfiltration units add to Plant C capacity. Two new Plant C sedimentation basins in operation.